The impact of bilingual road signs on motorists must be reviewed before any more are erected, the transport minister has said. Stewart Stevenson was responding to a call from Highland Council for more English-Gaelic signage on trunk roads. Mr Stevenson said there was anecdotal evidence of motorists performing u-turns on the carriageway after misreading the signs. The report from a review of existing trunk road signage is due in 2011. Highland Council's Gaelic committee wrote to Mr Stevenson asking that the review should not be seen as a barrier to the expansion of bilingual signage. 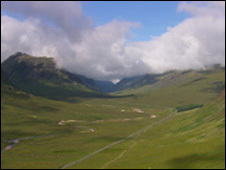 Road signs in both Gaelic and English have been requested by the local authority on key routes to and from the region. It has asked the Scottish Government to give "urgent consideration" to signage on the A9 from Perth northwards. Also on the A96 just east of Inverness and on the A82 through the centre of Inverness to the Kessock roundabout. Committee chairman Hamish Fraser said it would bring the language to the attention of more people. In his reply to the council, Mr Stevenson applauded its commitment to the language and its work in putting bilingual signs on local authority-controlled roads. However, he said the review required a minimum of three years of data gathered on what impact existing signage on trunk roads was having. Mr Stevenson said previous research had shown that drivers spent longer reading bilingual signs than those in one language. He said there was anecdotal evidence of motorists unfamiliar with an area stopping on the main carriageway of trunk roads to read the signs, performing u-turns after misreading the directions and driving past hotels because they were concentrating on a bilingual sign. The minister added: "We do not know if these and similar incidents are having a negative impact on road safety over time and this can only be determined from detailed accident studies. "Clearly it could be considered irresponsible not to evaluate the current policy." Mr Stevenson's response will be considered at Thursday's Gaelic committee.